Distraught by the death of his beloved wife and trusted friend, the Mughal Emperor Shah Jahan of India commissioned the construction of a beautiful mausoleum that would provide solace not just to himself, but to all who visited. According to Taj Mahal facts, the third wife of Mughal emperor Shah Jahan, Mumtaz Mahal, died in childbirth. She served her husband as an advisor and supported his aims. Mahal died as she gave birth to Gauhara Begum, the couple’s 14th child and last daughter. She survived her mother’s death and lived to the age of 75. The Taj Mahal was constructed during a golden period of the Mughal empire. Shah Jahan ruled over a prosperous time and erected many beautiful monuments that were representative of the Mughal architecture of the time. The Taj Mahal is the most popular example of monuments from this time period. The Taj Mahal is often seen as a beautiful symbol of love. Taj Mahal facts show that Shah Jahan’s admiration for his wife Mumtaz Mahal is idealized in stories of the building’s construction. The idyllic edifice and gardens add to the romance of the story. Jahan himself believed the Taj Mahal was a representation of Allah’s glory. The Taj Mahal is 240 feet tall, and the famous dome measures 115 feet. It took more than 20,000 builders 23 years to erect the tomb, dome and minarets that make this spectacular monument so unforgettable. Taj Mahal translates from Persian and Arabic to “Crown of Palaces” in English. The name perfectly suits Shah Jahan’s purpose of building a beautiful structure to mourn his beloved third wife. If one didn’t know that the Taj Mahal was a mausoleum, it could certainly be mistaken for one of the most beautiful palaces in the world. Taj Mahal facts indicate that because tall structures had an annoying habit of toppling over, the four functioning minarets of the Taj Mahal were constructed further away from the tomb. This way, if they fell, they wouldn’t harm the tomb in any way. The minarets were built to be usable. They are a traditional part of a mosque and allow the muezzin to call those who practice Islam to prayer. Beautiful calligraphy is inlaid into the white marble of the Taj Mahal. Amanat Khan Shirazi created the calligraphy by inlaying black marble into white marble panels. Many surahs, or verses, from the Quran are used in the calligraphy, as well as original work by Shirazi. Taj Mahal facts show that in addition to the gorgeous calligraphy that drew Shah Jahan’s admiration, abstract forms also fill the walls. A World Heritage Site and an amazing example of Mughal architecture, the Taj Mahal is a popular tourist destination. It draws more than three million visitors a year to Agra in India. In order to keep the gorgeous white marble structure gleaming and pristine, no pollutants are allowed near the Taj Mahal. Visitors must park in a parking lot, then either walk or take an electric bus to the historic site. Shah Jahan loved symmetry and it is believed that he wanted to build a black Taj Mahal opposite the white marble Taj Mahal. Jean-Baptiste Tavernier spoke about this idea and popularized the myth in the 17th century. There is currently no evidence to support this myth, however. At one time, black stones were found across the river from the Taj Mahal and were thought to support the idea of a black Taj Mahal. Later, it was shown the stones were actually discolored white stones. It is more probable that the idea of the black Taj Mahal comes from the reflection of the Taj Mahal in the original reflecting pool. Surprisingly, the structure’s reflection appeared black. One prevalent myth that surrounds the Taj Mahal is that Shah Jahan executed those that worked on the structure so that they would never be able to build a more beautiful building, or reveal its secrets. Taj Mahal facts indicate it is more likely that the craftsmen and architects involved in building the Taj Mahal signed what we would now term as confidentiality agreements and promised to not build something similar. The white marble of the Taj Mahal no longer gleams brightly as it used to. The beautiful stone has been damaged by pollution and is gradually turning yellow. To combat this unwanted change, the Indian government has instituted harsher emission standards for the area in order to cut back on the damaging pollution. The Indian government has erected scaffolding on three separate occasions to hide the Taj Mahal during times of war. Taj Mahal facts tell us that the first time this happened was in 1942 when the Indian government feared an air attack from Japan. The second and third times scaffolding was used to conceal the Taj Mahal were during the India-Pakistan wars in 1965 and again in 1971. The Taj Mahal Is Cracking and Tilting.. 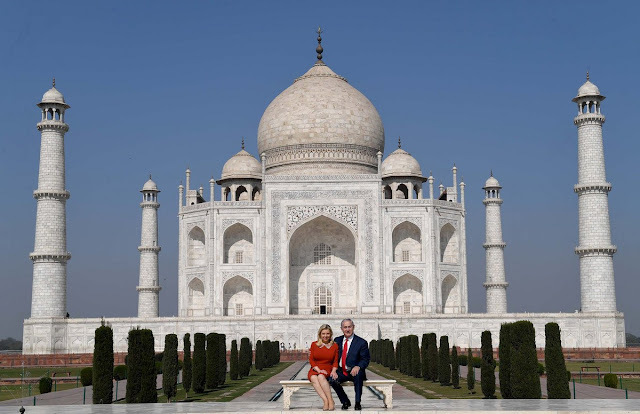 The Taj Mahal has a wooden foundation that is believed to be rotting because of lower water levels in the Yamuna river, which runs beside the monument. Cracks have appeared in the tomb walls and the minarets are tilting. Jahan’s Son Buried Him in the Taj Mahal along with Mumtaz.. In 1858, Jahan’s son Aurangzeb declared Jahan unfit to rule and placed him under house arrest in Agra. Jahan died eight years later and was buried next to Mumtaz Mahal at the Taj Mahal. The Jats Raided the Taj Mahal.. The Jat of the Bharatpur dynasty in India raided the Taj Mahal when they invaded Agra in the 1700s. It is believed they removed a gold shield from the dome of the tomb and two chandeliers, one made of agate and another made of silver. Unfortunately, this wasn’t the only time the Taj Mahal was raided. British Soldiers Defaced the Taj Mahal in the 19th Century.. In the 19th century, British soldiers defaced the Taj Mahal during the Indian Rebellion of 1857. It is believed these soldiers removed precious gems embedded in the walls of the Taj Mahal. Thankfully, British viceroy Lord Curzon set in motion the restoration of the Taj after it had been defaced by the British and sacked by the Jats. He even commissioned a new lamp, perhaps to replace one of the chandeliers the Jats had stolen. During the restoration of the Taj Mahal, the garden was redesigned. The lawn and gardens we see there today are in the British style, as it was the British who undertook the restoration project of this architectural wonder. Mughal emperor Shah Jahan commissioned the Taj Mahal after the death of his beloved wife, Mumtaz Mahal, who died in childbirth. It took 23 years to build the white marble tomb and minarets that would later become known worldwide as a symbol of love. Shah Jahan’s son buried his father next to Mahal upon his death. A beautiful example of Mughal architecture, the Taj Mahal is suffering from the effects of pollution and age. The white marble is yellowing and the structure is cracking and tilting. India is taking steps to remedy the situation.